Mandarin collar. Raglan sleeves with thumbholes on cuffs. Reflective piping on raglan seams. Contrast zip. Contrast breathable mesh side panels. Flatlock stitching. 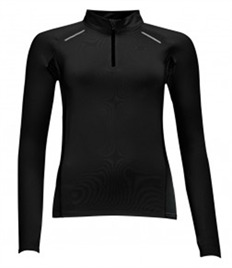 Price breaks available for branded SOL'S Ladies Berlin Long Sleeve Zip Neck Running Top. Prices include one small embroidery or print position.